This is Part 1 of a series of posts on Lean Project Management and Visual Work Management methodology and tools. First, Lean project management takes the best from Lean manufacturing and Agile product development to deliver products to market at an accelerated rate. What is the goal of implementing Lean project management? The goal of implementing Lean project management is most often profit. In order to achieve profit several conditions must exist. Profit is driven by sales volumes, Cost of Goods Sold, sales price and expenses. Sales volume and price are heavily driven by time-to-market (project duration) and the Cost of Delaying market launch is usually quite high. Sales volume, price, and Cost of Goods Sold (COGS) are also heavily driven by the level of innovation in our products. With innovation comes risk (uncertainty) and variability, and required learning. Innovation is often required to reduce COGS (e.g. new manufacturing processes) as well as increase sales volumes and price via new capabilities in our products. In the end, successful product development projects require the right innovative product, at the right price, delivered to market cost effectively, quickly, and predictably. The goal of Lean Agile project management is to give us the best chance possible of achieving this outcome. And certainly we can impact them in different ratios. The triangle isn't really always equilateral. And different shapes deliver different business value, as we'll see below. The sides of this triangle are more independent than the original theory recognizes. It is absolutely possible to maintain or increase scope while reducing schedule or cost or both, and Lean shows us many ways to do just that. We do it by working smarter, not harder. Shown below is a Current Reality Tree (CRT), which is one of the many tools and methods I like from the Theory of Constraints body of work. It shows many of the largest problems plaguing typical hardware or integrated product development teams today. It shows the symptoms toward the top, the root causes toward the bottom, and the self-reinforcing loops (shown in dashed lines) which tend to keep our projects stuck in low-gear. 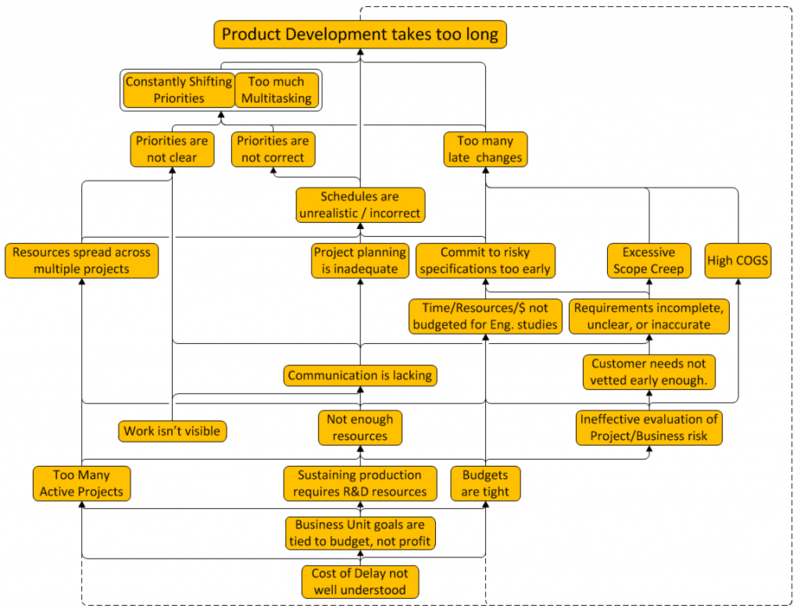 Note, this is a simplified form of the conditions in hardware product development. Many other connections and problems have been omitted to make it readable. (You probably have a few to add to this list.) It’s truly a mess out there, and our challenge in Lean Project Management is to solve all of these problems and a great many more, in one way or another, without creating any new problems in the process. By close examination of these related problems, we can start to see some of the ways we got into this mess. One of the root causes is placing too much emphasis on reducing expenses (budgets), which can backfire. The result of a tight budget is often a longer and more expensive project as we realize the costs of risks we didn’t mitigate, including the risk that our customers won’t buy it. Reworks cause delays and/or cost overruns, and/or sales suffer. 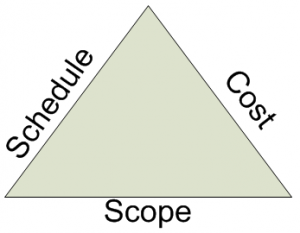 This makes managers want to get started on the next project in hopes of completing the next product earlier, but this is the self-reinforcing loop which causes more tight budgets, and resources spread even more thinly – and so the cycle continues until it ends up looking like the triangles below. As shown in the triangle on the right, where we successfully reduce cost, we may pay for it by increasing time to market. One common example is to plan our resources to high levels of utilization. The result is multiple overlapped projects with much, much longer durations. However, with Cost of Delay as high as it is ($500,000 per month is not unusual), we often want the shortest possible duration, with costs being whatever it takes to get that short duration. For example, with a $500K/mo COD, we make $400K more profit by making the expenses line $100K longer to make the schedule line 1 month shorter. An optimum (maximum profit) Lean shape looks more like this. We achieve the shape of the triangle below by bringing the Cost of Delay to light and making economic tradeoffs at a system level, which lead to reducing (actual) schedule and increasing profits. Note, what matters is reducing actual project duration. Making planned schedules shorter via ‘just do it faster’ pressure often has the same impact as tight budgets. This approach actually makes projects longer and more expensive in the same risk-realizing ways. This is one of the big problems at the center of the tree. We shorten both planned and actual schedules by working smarter, not harder. For example, in the typical company depicted in the CRT, ‘do it faster’ results in planned schedules which are the ‘everything-goes-right happy path’, which almost never works out. As delays occur, more risks are taken, and the delays multiply. Achieving the shortest actual schedule generally requires a high level of planned project risk management, (proactive knowledge and learning management) which makes the planned schedule a bit longer than the happy path, but a lot more realistic. In addition to healthy risk management, there are a lot of other Lean and Agile methods and tools we can use to flatten and reshape the triangle. The best tools and methods for us depend on the types of projects we execute. For example, not everything that works for software projects works well for hardware projects, and vice versa. We will start to examine the different solutions in more detail in the next post. One solution which is beneficial in a vast majority of projects is what is commonly called visual management. There are several different forms of visual management, some of which are better than others for different types of projects. In this series we will explore the underlying characteristics and principles of our hardware product development system, in order to see what the various visual management tools and methods do (and don’t do) to improve our systems. Please join us as we examine these problems, and their solutions, at a more detailed level where we uncover some powerful ways to quickly improve our systems! In Part 2, we will review some different schools of Lean and their take on the problems slowing down development teams today. Want to know the real cause of project delays? It's not what you think. Watch this 9-minute video to find out.